I don't follow Hollywood twaddle as a rule. It just doesn't interest me. But even in rural Idaho, we can't help hearing the news headlines that emerge from the land of glitz and glamor. The other day my Older Daughter turned to me and asked when her father and I got married. "In May of 1990," I replied. "Why?" There was a pause. "Then you've been married 109 Kardashians," she said. Come to find out she was using a nifty new online tool called the Kardashian Calculator which determines how many "Kardashians" you've been married. And a Kardashian, as you may deduce, is a unit of measure representing 72 days of marriage, in (cough) honor of Kim Kardashian's short-lived eternal vows. And yet our culture still looks up to these Hollywood twits as if they were someone to admire. It's funny how my respect for an actor or actress (despite our almost inevitable difference in political opinion) increases when I learn they can actually keep their marriage together. 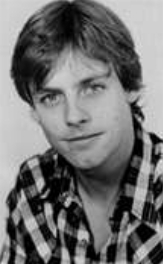 For example, back in the late 70s when Star Wars was first released, I -- along with millions of other teenage girls -- developed a serious crush on actor Mark Hamill, who played Luke Skywalker. But as the years went by I forgot all about him, and in fact never gave him much thought for several decades. Recently I got curious about what he'd been doing since I last paid attention, and decided to look him up. Come to find out he's been faithfully been married since 1978 (that's about 171 Kardashians). Whatever else you can say about him, my estimation of him immediately ratcheted up because here's a rare Hollywood type who can keep his vows. But of course we'll never hear about this in the headlines. Glitter and glitz, drama and crisis, is what makes the news. But if you're going to admire a Hollywood actor, go for the ones who truly DO offer an example to emulate. Here's another actor to "look up to." Eric Braeden of the soap opera Young and the Restless has been married to his wife for over forty years! That's gotta be a record! And I forgot to add that Kelly Ripa from the morning show Live with Regis and Kelly has been married to her husband for 17 years. There are a very, very, few celebs who are able to stay married this long. Acting used to be the prized art skill of Hollywood. Today, we have replaced that theatrical skill with idolation of reality "stars" that have no skills other than to be easily bought and followed by paparazzi and glazed over on front page magazine covers. I am still perplexed as to why so many still find these stars so fascinating, that they waste their funds on supporting these tabloids,their product lines, and peer into their twitter lives all day. Are their own lives that purposeless, that they must seek some pseudo sense of false enjoyment from others unreal sick lives? It all makes a mockery of marriage, loyalty, and the woman-man relationship to uphold a vow they took, a life-long commitment. You know, till death do us part. It's no wonder our society is so frayed at the healthy relationship level of upholding commitments made to each other, both personal and business ones made to another. Real Life is NOT Hollywood. Confusing our values of marriage, by these morally irresponsible stars of inequity, is proponing societal acceptance of easy outs to vows taken for life long commitments made, by equally easy divorces, and this tabloid fodder readily shown by countless numbers of poor other examples and seen by all, but the blind, is detrimental and countermanding to the societal biblical law model and the real life values for long lasting marital relationships. So, next time you see this trash at the checkouts, turn the magazines covers around. Better yet, say loudly, what blatant nincompoops! while pointing to the cover. It's within our reach and it's our responsibility to stop this kind of trash from becoming mainstream. Devalue it. Don't continue to feed the sources with your money, your time, looking at their lives, or their product lines. Stop the idolizing of any people with sick societal values. Mark Hamill found his true love and then waved his Jedi hand and said: "I AM the handsome hunk you've been lookin' for." True story and if you doubt me, I'm sure I'll find your lack of faith disturbing - AAARRRGGGHHH!!! We're beginners apparently. 92.1 Kardashian units and counting. Michael Dean Miller - LOL! That was great! Math makes my head hurt so I'll just use the old fashioned method and say I'm going on 42 years with the old Jedi I married. I, too find a long-lived marriage a point of respect. Anyone who can keep that vow in the face of such temptation the world throws at us today is to be admired. Charlton Heston remained married to the same woman for a good number of years, and so did Gregory Peck.